Graham Chedd here. Last time, I was telling you about our visit to the European Synchrotron Radiation Facility – and about the trouble I got into there. We’d come to the European Synchrotron Radiation Facility at the invitation of Tanya Smith, who works at the Max Planck Institute for Evolutionary Anthropology in Leipzig, Germany (where there’s a lot of very cool Human Spark-type research going on, so we’ll be filming there later). Tanya is an expert on teeth, which as she points out are by far the most durable parts of our bodies – in fact they are practically fossilized as they grow. What’s more – and I found this astonishing when she first told me – teeth have daily growth lines hidden inside them, much like tree rings, which can reveal their owner’s early life history – and how quickly they grew up. 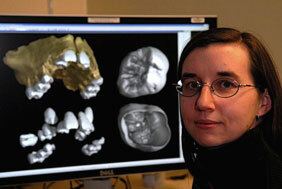 Here’s Tanya, alongside some 3-D images of Neanderthal teeth. Peering inside teeth to see those growth rings needs very powerful X-ray beams – beams millions of times stronger than you get from your dentist. That’s where the synchrotron comes in. And because the X-rays are so potent they are also deadly, which is why there are all sorts of safety precautions. For instance, we were allowed inside the synchrotron while the beam was turned off for routine maintenance for an hour or so, and we were all given special little keys. The synchrotron can’t be turned on until all these keys are returned and in their little locks. including in the room where the teeth were actually scanned. Now, before the beam is activated the room it has to be cleared of people, and to make sure the room is thoroughly checked, there are buttons in the corners that have to be pushed. I volunteered to push one of these buttons – and pushed this one. Of course, it was the wrong one (pretty obvious now, but at the time… not so much). An eerie silence fell as the entire facility, except for the lights, shut down. After a moment of shocked disbelief (“What did you do! ?”), Paul Tafforeau, who is Tanya’s collaborator at the ESRF, recovered his composure and set about informing the authorities what had happened and getting everything back up and running again. He even forgave me (sort of) and no one came to haul me away. 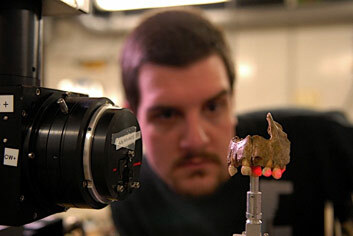 Here’s Paul, with another set of Neanderthal teeth, these from a child. This fossil has a fascinating story, and one we’ll tell in the show, because it was the first Neanderthal fossil ever discovered, in 1829, long before Neanderthals were officially recognized and named, and long before Darwin suggested that humans had evolved. We don’t yet know what Paul and Tanya found out from the scans. That’s going to take several months of careful growth ring counting and analysis. But we do know they were happy with the images they got, and that by the time we get to putting together our program, they’ll be able to tell us how quickly these Neanderthal children grew up. Next we’re off to the University of Oregon in Eugene, where we’ll find out what parts of Alan’s brain provide him with a couple of uniquely human skills – his facility with language, and the ability to use a screwdriver…. I just hope there are no big red buttons.